The Timeline Keynote Template allows professionals to quickly and easily create presentations focusing on a company’s timeline and milestones. Whether you’re sharing a succession plan for your mature business or charting the next few months for your high-growth company, the Timeline Keynote Template allows you to easily update the timeline’s or milestone’s text while preserving the crisp slides’ designs. Finally fit your company’s five year plan neatly onto one slide without using size 10 font. 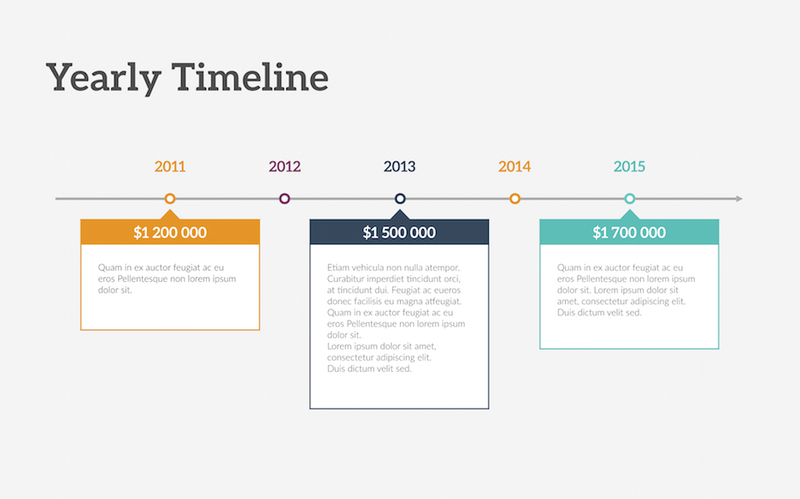 The Timeline Keynote Template contains 16 fully editable slides available in 7 color schemes. Featuring weekly and yearly timelines and milestone maps, the templates make it easy to share high-level thoughts with the rest of the team and company. Discussing benchmarks listed clearly on slides allows everyone to make connections between significant events and continue to improve the business or project. 16 unique presentation slides designed by professionals that you can easily edit and fill out with your personal content. 3 icons are used in this template which you can flawlessly move, resize or change colors throughout your presentation slides. 7 color flavours are available in this template. You can easily choose the color scheme that fits your needs. What's included in Timeline Keynote Template?